Who to believe, once again. The Washington Post on Dec. 15 reported that the Centers for Disease Control and Prevention has been instructed to not use seven words (including two two-word phrases) in budget documents. Later CDC Director Dr. Brenda Fitzgerald partly refuted that, “calling the report ‘a complete mischaracterization of discussions regarding the budget formulation process,'” reported The Boston Globe’s science news site STAT. Between the news and Paul, I saw this as a writing prompt. If it’s not particularly literary then call it a self-dare. That is, to use all 14 in a single sentence. Note: It’s awkward for me to use cuss words in writing. Besides, it may offend my 14 readers. Hence asterisks abound. Sign on Maple Street, University of Arkansas, still up Sept. 10, 2017. 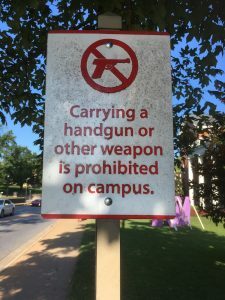 It’s been nine days since guns became technically legal at Arkansas colleges and universities (and some other places) when carried by holders of enhanced concealed weapon state permits, and no one’s been shot on campus. That includes a major football game. Heck, professors already have assigned papers to write, books to read and problem sets to solve. Mixers have been held on weekend nights, and the hapless failed to, er, mix. “Technically” is the key word. Those folks need 8 more hours of “enhanced” training for campus concealed carry, in addition to the 6 now required for general carry. Good news: Training hasn’t begun, so no enhanced permits yet. The State Police began figuring out what’s to be taught Sept. 1, the same day the ASP was allowed to begin determining the other particulars of the new weapons laws. Better news: The officials have up to 120 days — that is, no later than Dec. 30, 2017 — to ink those regulations. Then people legally can begin wearing bulky jackets for another reason besides that it’s December. Fortunately, the Legislature added an examption to continue weapons bans at sporting events. 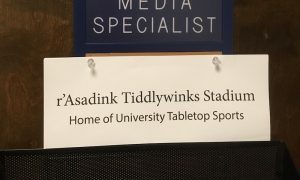 This makes me bulletproof as I am declaring my academic office an athletic facility. I could be threatened from the door of my table sports arena, but the shooter would be in big big trouble. I’m rating this good news, what with natural disasters and divisive politics. There’s more to praise. Yeah, as if my praise means anything in the greater concept of the world. So let’s herald approximately three other bits. Being acrimonious about acronyms is a worthy goal. Presidents used to be known by abbreviations. Now there are calls for the new president’s term to be abbreviated by impeachment or the 25th Amendment. My suggestion as a longtime editor would be shorten by language. One nostalgic spot where initials were great was in headlines about political leaders — FDR, HST, JFK, LBJ. They’re also smooth to say out loud, which is a key to my editing style. Eisenhower had the easy-to-speak “Ike” so never did we read DDE. In Arkansas, WR was the way the copy desk wrote single-column-wide headlines for Gov. Winthrop Rockefeller in the late 1960s. Nixon fit in narrow columns, the “i” being one of the “l-i-f-t” half-count letters. RMN did not glide on the tongue, and Nixon was only a 5-count, Ford 4 1/2. I guess the style fell out of favor in the Jimmy Carter years, no JEC. Last year saw the potential for the return of a need for an leader name abbreviation. Hillary Rodham Clinton would’ve been perfect for headlines in any media as HRC to distinguish instantly from the previous President Clinton. HRC fell, though. The Republican nominee won. Yet I cannot and have not said or written Donald J. Trump in the same sentence after the. A longtime Onion fan, I had to see Scott Dikkers, an early editor and former, longtime owner of the satiric website. He spoke March 10 at the University of Arkansas. About a hundred people attended the midweek evening lecture, which the sponsoring Honors College publicized widely. Also compelling me to learn more about this successful enterprise was my being a working journalist, sometime educator and freelance media ethicist. Yet, the Journalism Department did not co-sponsor the speech, nor were any faculty apparently present. The campus newspaper did not cover the event. Dikkers asked if any journalism students were in the audience, and one person raised a hand. One. Instead of considering what that says about my ol’ haunt, here are highlights of the talk, on behalf of a friend who couldn’t go and asked for them (she was an Arkansas State University J major). Don’t Just Work Hard, Work Smart; Not Just Work Smart, Work Right — learn from the mistakes and successes of predecessors, rivals, competitors because that’s efficient. “Cults, Conspiracies and the Twisted History of Sleepytime Tea” by Megan Giller may well keep you awake. Celestial Seasonings had somewhat predictable beginnings in the hippy movement of the late 1960s and early 1970s. But besides free love and illicit drugs, that period saw lots of spiritual explorations and offbeat theories. The herbal tea founders were inspired by one called “Urantia.” It is definitely strange. And unsettling, the opposite of Sleepytime, which My Beloved and I have enjoyed a few evenings a week for many years. The story is in the online Van Winkle’s, an electronic publication about all matters relating to sleep, produced by the new online mattress company Casper. Does anyone see “news” or “iournalism” in there? Maybe they’re implied, if you squint, but otherwise, nope. Time Magazine’s selection of German Chancellor Angela Merkel as 2015 Person of the Year is fascinating.. It shows the magazine still heeds that this award is not for popularity nor just for Yankees. It’s for the person who’s been, what, the biggest newsmaker of the calendar year. Its cover story profiling Merkel proves the point. Not least interesting is that she has a Ph.D. in quantum chemistry. If there’s just two biographical bits that make her the kind of leader she has been, that’s one. The other is she grew up in the now-former East Germany. She understands that life. The article is long but rewarding. To see the highlights, view the sidebar, “The 13 Most Surprising Things You Never Knew About Angela Merkel.” For ease click “View as List, as the default “View as Gallery” is a slideshow that you have to wait each time to open a page. Germany has been fortunate to have such a strong, focused and clever leader this past decade.